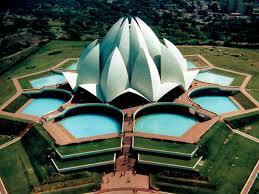 All Bahá'í Houses of Worship, including the Lotus Temple, share certain architectural elements, some of which are specified by Bahá'í scripture. 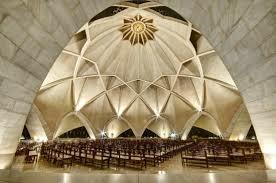 `Abdu'l-Bahá, the son of the founder, stipulated that an essential architectural character of a House of Worship is a nine-sided circular shape. While all current Bahá'í Houses of Worship have a dome, this is not regarded as an essential part of their architecture. Bahá'í scripture also states that no pictures, statues or images be displayed within the House of Worship and no pulpits or altars be incorporated as an architectural feature (readers may stand behind simple portable lecture stands). 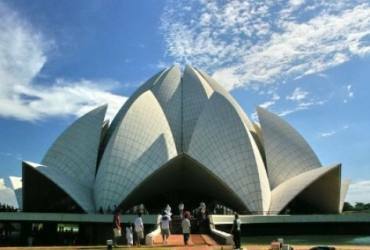 Inspired by the lotus flower, the design for the House of Worship is composed of 27 free-standing marble-clad "petals" arranged in clusters of three to form nine sides. 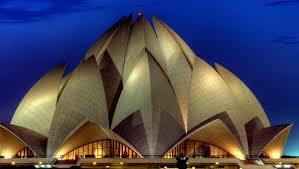 The nine doors of the Lotus Temple open onto a central hall, is capable of holding up to 2,500 people. The surface of the House of Worship is made of white marble from Penteli mountain in Greece, the very same from which many ancient monuments and other Bahá'í Houses of Worship are built. 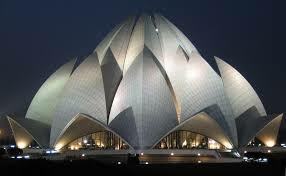 Along with its nine surrounding ponds and the gardens, the Lotus Temple property comprises 26 acres.